Subject: Urgent TV Request - Canadian Pacific Images for "Around the World by Train." My name is Jennifer Perelli and I work for a television company in the UK called The Gamma Project. We are producing a railway series called Around the World by Train and our final episode our series tells the extraordinary story of railway building on the American railway. We are now editing the show and are in need of some archive material. We are really hoping to feature the below image in our final show and we were wondering (and really hoping) that you could shed some light as to the origin of the image and if you could [locate] a high-resolution copy of the image. Any help/information would be fantastic. Thanks again! Does anyone have any information about the Chinese railroad worker unknown image shown above? Which railroad, location, photographer, source of a high resolution image, etc.? 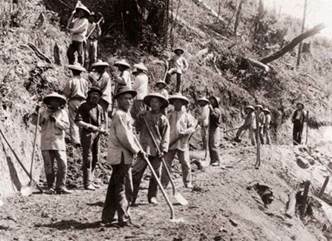 I believe the photo shows Chinese workers building the Loma Prieta Lumber Co.'s railroad, near Aptos and Watsonville, California, about 1885 – Pajaro Valley Historical Association.